If you are bored with your Android Default Lock screen and want to try something new, yes you can do that easily without rooting or flashing your Android phone. There are so many apps available in the Android Market which helps you to change the Android default Lock screen. So here we are going to show you how you can customize the Android lock screen easily with these apps. MagicLocker is a free android app which aims to provide users more colorful and flexible Lockscreen choices by applying different themes. It has lots of Lock screen themes which you can select from the MagicLocker settings and install that lockscreen theme in your Android phone. 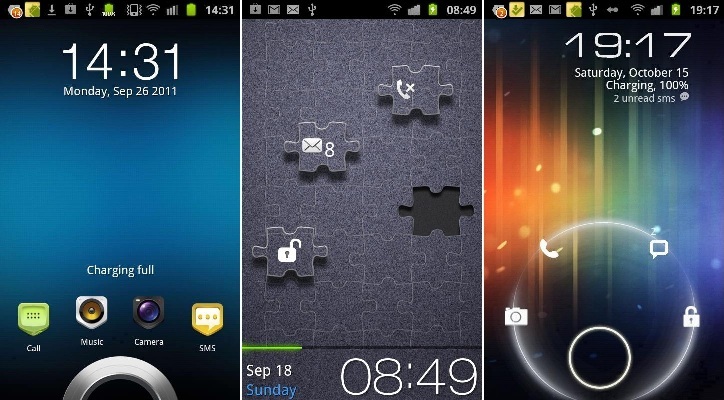 You can also download more Lockscreeen themes from the android market and install it in your phone. To find more Lockscreen themes press ‘More Themes’ button in ‘MagicLocker Setting -> Themes Tab’. Or search ‘mobi.lockscreen.magiclocker.theme’ in Google Market directly. This one is paid app and one of our favorite, WidgetLocker gives you the total control of the look, feel and layout of your lock screen. With the help of this app you can Drag and Drop placement of Sliders, Android Widgets and App Shortcuts on Lick screen and it has lots of built-in styles lockscreen like Ice Cream Sandwich, Gingerbread, Sense and Sense 3, Motorola, iPhone, and Rotary. A unique feature of this app is the custom sliders. Slider Actions can be customized, for example Slide-to-launch-Camera or Slide-to-call-your-Girlfriend.